The palmetto tree is perhaps the most recognized and beloved symbol of our state. That said, many South Carolinians would be surprised to learn that botanists do not consider it a true tree because it lacks a solid wood trunk. However, the flexibility of its trunk, together with its strong root system, enable the palmetto to withstand the fierce winds that so often strike our coastline. The word palmetto derives from the Spanish word palmito, which means little palm. The most common palmetto species seen in South Carolina is the Sabal palmetto, which can grow as high as 65 feet. It is also known as a cabbage palmetto because when it is cooked, the heart of its trunk tastes like cabbage. However, we don’t suggest trying this since removing the heart of a palmetto tree will kill it! Note: If you are really hankering for some palmetto, you can always shimmy up to very the top of a tree and slice off a piece of its stem. This is also said to taste like cabbage or artichoke. Our famous trees’ spongy trunks were used to build the walls of Fort Moultrie on Sullivan’s Island, then called Fort Sullivan. The trunks successfully absorbed the brutal impact of British cannonballs during the Revolutionary War battle in 1776. Colonel William Moultrie led the soldiers to victory, and the fort was renamed in his honor. 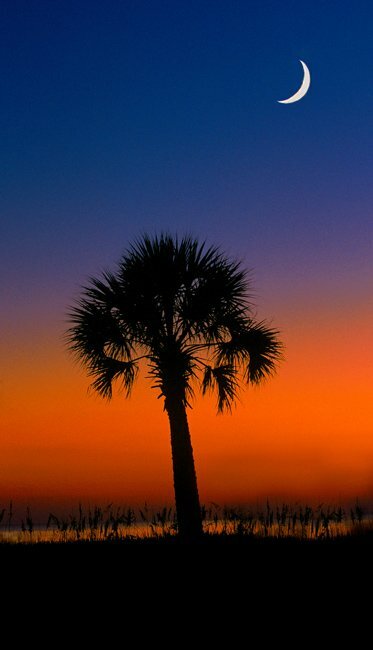 History makes this picture especially unique, since photographer Rikki Moye went out to Fort Moultrie to capture this perfect palmetto and crescent moon shot. If the sky were a dark indigo blue, it could practically be a photograph of our state flag! Learn more about South Carolina State Symbols. View more pictures of renowned South Carolina trees. Beautiful and great information. I love South Carolina. In heraldry, a crescent is one of the marks of cadency, or birth order. The crescent is the mark of the second son. Perhaps the flag bears a crescent because Fort Moultrie was garrisoned by the second regiment. How can I get a copy to frame? How could I get a copy of this picture to frame for my wall? What is the significance of the moon in the SC flag? Why is it there? This website is really helpful to my students. When we have projects that need to be done they can ALWAYS count on this website! It really is good and has very helpful information.